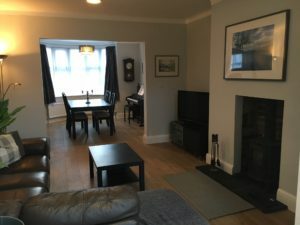 This semi-detached property had a large garden which was not benefiting from a favourable connection to the house. The main building had an ‘off-shot’ kitchen at the rear (originally built as a wash-house and for storing coals). It had not been altered since the early 1960s, aside from the addition of a UPVC porch during the 1990s. It was very cold and suffered with mould due to its single-brick construction, concrete floor and lack of insulation. 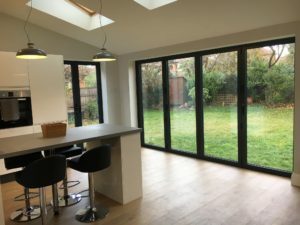 Also, as the kitchen was not full-width, it also created a dark patio area outside the rear reception room, which had an outdated single aluminium double-glazed French door offering a restricted view of the large garden (and limited access to it). 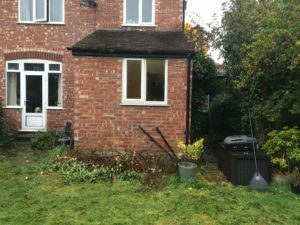 The existing kitchen needed to be removed and replaced with a new extension that maximised enjoyment of the garden, with regard to both view and access. 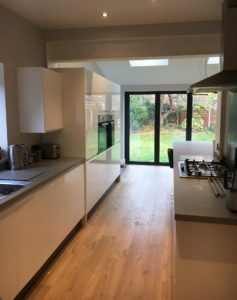 The extension had to meet building regulations and link well with the rest of the house, particularly the living areas, while offering lots of natural light to avoid dark areas. 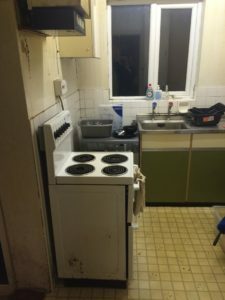 A new central heating system was also required, with a new location for the boiler (formerly in the kitchen) and numerous radiators; and also modernisation of the first-floor bathroom and toilet, which were separate. The house’s ground floor has been transformed into a light, open space that is also cosy where needed, particularly in the lounge area. 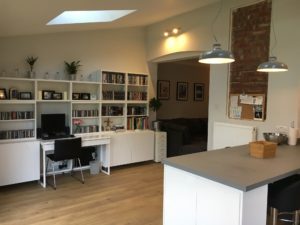 There is both a formal dining space at the front of the living space; and a breakfast bar for more casual dining, which can seat at least four people. The view of the large garden has been maximised by bi-folding doors and side-aspect French doors, without any loss of heat thanks to strategic heating and substantial insulation. Access to the garden is generous from both living space and kitchen, which also link seamlessly together while still feeling like separate zones. 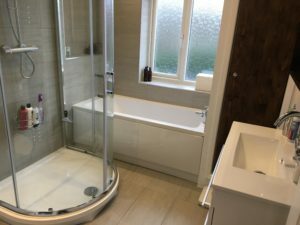 The bathroom is hugely improved with both a bath and separate shower; and provides a more convenient location for the boiler (previously housed in the old kitchen). All improvements have been achieved within the realm of permitted development, with full adherence to building regulations, including structural safety, energy efficiency, use of materials, electrical installation, heating installation and chimney alterations for the log burner. This was imperative for safety and legality; and also in case the property is offered for sale in future.